I’ve found that java.util.Scanner class instead of the java.io classes to work well for most of my text file reading and parsing needs. For more info read up natch3z or coderwall. Let’s say you have a buildfile build.xml that builds your project and deploys to say Tomcat. Wouldn’t it be great to have Eclipse do that for your when you build the project within eclipse? 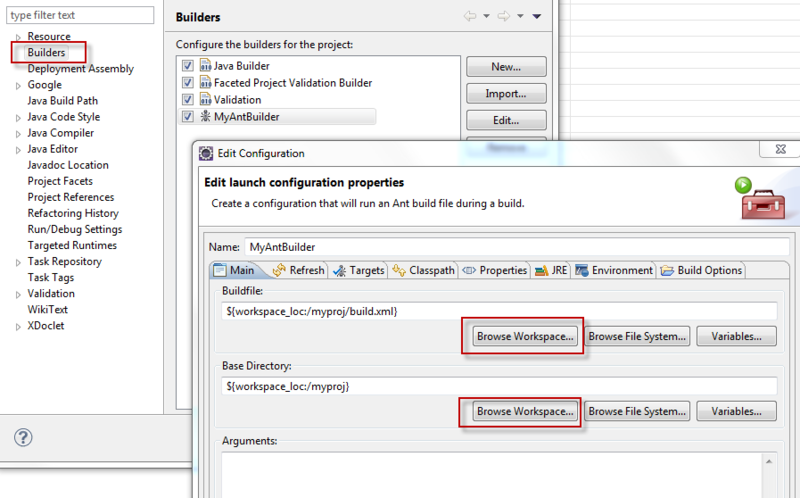 Eclipse has this concept called Builders as part of your project properties that let’s you do just that. When you build (Ctrl+B) in eclipse, the specified ant target will be run for you and in my case, my application will be deployed to Tomcat. 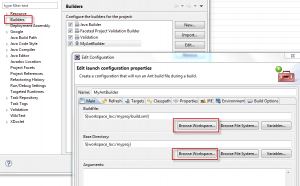 If you want to run a script, you can do so by selecting Program instead of Ant Builder. Here’s a screenshot of my Ant Builder. Did you know you could also debug your Ant Script within Eclipse. Another great post on IBM Developer Works. Using the top -H command to show you the thread ids, and from the thread dump, you can correlate the thread that’s taking CPU time. For example the stack trace will show you the ID in hex format and the top will show you the thread PID in decimal format. Notice that nid=0x6c21 (top -H) is the same as 27681 (from the thread dump).